Apple is beefing up its MacBook to destroy the competition! 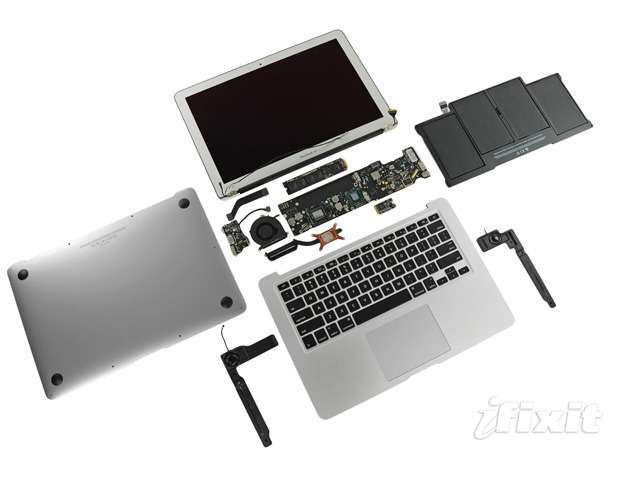 The latest Macbook Air was opened up by iFixit’s labs. The powerful machine is made up of 12 pieces. Although it is much different from the previous Air releases, some internal changes gave the new MacBook a packing punch. iFixit noted that the only identifiable change in the exterior is the “lightning bolt” that denotes the new MacBook Air’s Thunderbolt port. The same ten pentalobe screws hold the bottom plate on the carved aluminum unibody, so with the right screwdriver it’s as easy to access the internals as the previous models. Inside, Everything seems largely same as well. The new Airs use the same small, blade-type SSDs as last year’s model, so it’s possible to upgrade on your own if you like. And RAM remains soldered directly to the motherboard. Speaker enclosures, battery, cooling, and the overall logic board are also the same. However, there are a few changes. An updated wireless module includes a Broadcom BCM20702 Single-Chip Bluetooth 4.0 Processor with Bluetooth Low Energy (BLE) support. According to iFixit, the newer Bluetooth standard offers improved security, very low latency, and less power consumption. With graphics now handled by an on-die Intel HD 3000 IGP, there is no longer a need for the NVIDIA 320M controller with integrated graphics. That chip has been replaced with an Intel platform controller hub labelled “E78296 01PB10 / E116A746 SLJ4K.” Finally, the keyboard now contains a series of LEDs and optical channels necessary for the return of a backlit keyboard to the MacBook Air line. A new ribbon cable connects the the LED array to the logic board to provide power for the backlighting.